The walls of our bathroom are lined with marble slabs that we believe were part of the original house construction about 100 years ago. Of course the marble has been around a lot longer than that since it came from a quarry 20 kilometers (12 miles) from here where 2000 years ago the Romans were mining this beautiful rock formed perhaps 500 million years before then. What we recently discovered is that this same quarry supplied 80 percent of the red marble used to decorate the Palace of Versailles beginning in the middle 1600s and they’re not finished yet. An organization that you might think of as “Friends of Marble” was searching through the archival records about the quarry and found an order for a 3 ton piece of red marble to be used in the chapel at Versailles. It was dated 1670 and had apparently never been filled. Honoring its commitment, Les Marbrieres de Caunes plans to ship the stone north to the palace exactly as it would have traveled 350 years ago: by water. The journey will begin on a flat bottomed barge on, what was at the time that order was placed, the brand new Canal-du-Midi. This waterway that runs through Carcassonne will transport its cargo westward to Toulouse where the Garonne River will take it out to the Atlantic Ocean. From there, up through the English Channel, into the River Seine, through Paris, and then to its final destination. The “Friends” association plans to slow what would have taken 6 months in Louis XIV’s era into a year-long journey to allow for promotion of this area. Versailles and our bathroom weren’t the only places to benefit from this work of natural art. On our first visit to Bordeaux (Bordeaux in 4 days) we stopped at Place de la Victoire to see a column from this quarry and Carcassonne has its share as well. 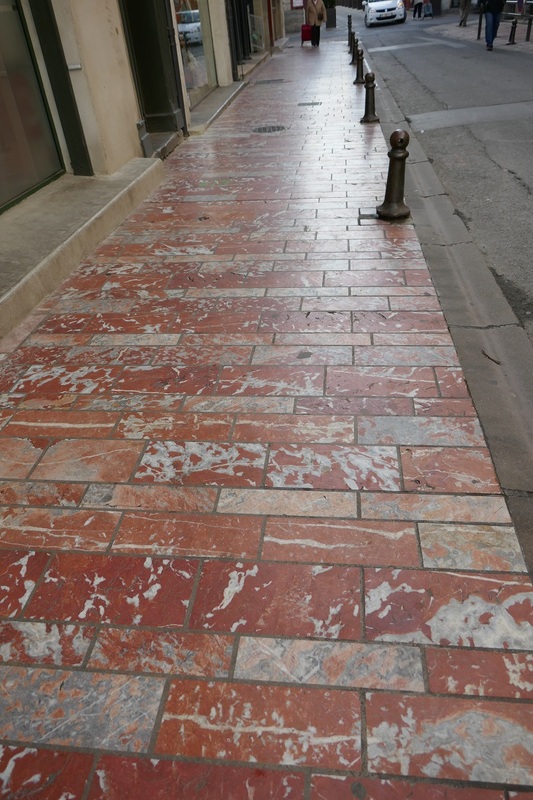 Perhaps in the days of Christopher Columbus the New World streets were paved with gold but here it’s red marble, or at least the sidewalks around the main square. 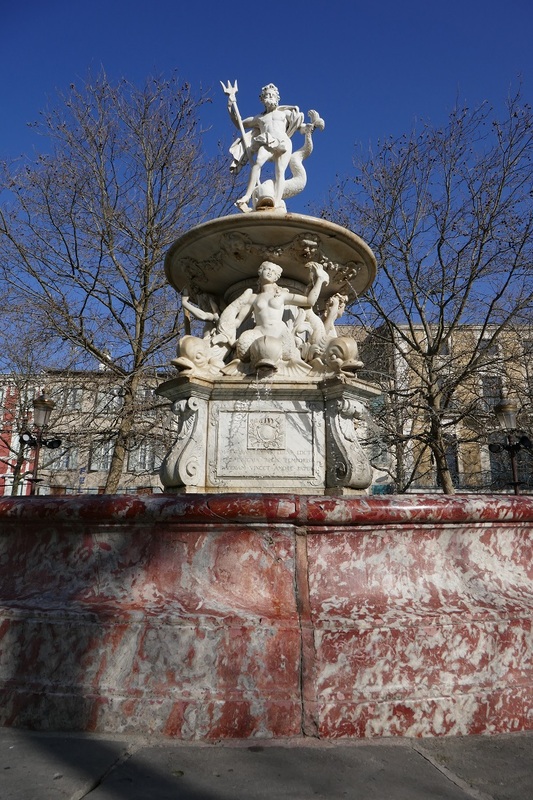 Also there on Place Carnot the base of the fountain from 1771 is carved from the same material. 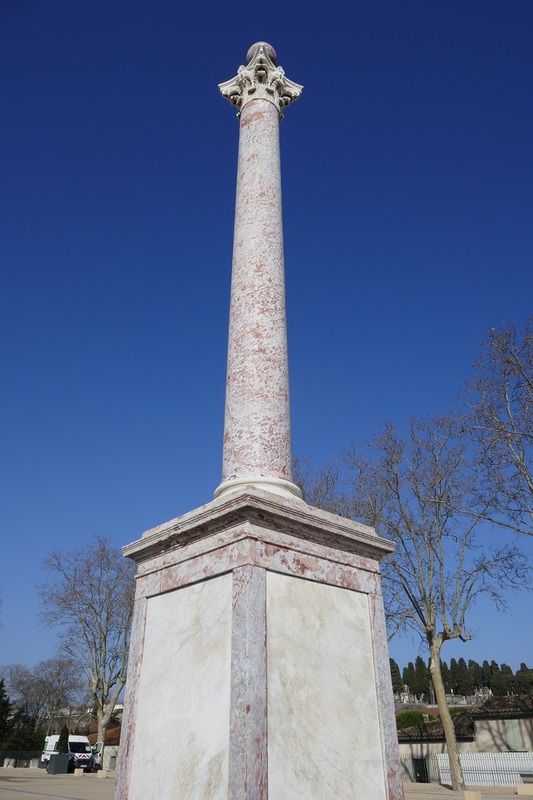 And, like Bordeaux, we too have a marble column; this one stands on Square Chenier by the train station. Before we moved here and many times since we’ve been told that if there were one thing that we would learn by moving to France it would be “patience”. Looks like in this case that’s been a lesson long in the making. Posted on April 7, 2019, in Life in France and tagged Americans in Carcassonne, France. Bookmark the permalink. 3 Comments. I love the idea of a marble safari! And what luck to have some of that beautiful stone in your home. We now have to go back to Versailles with a different viewpoint and see if we can identify the local marble. We do know they are missing one column because Carcassonne still has it! We were just at Versailles a couple of days ago. We noticed the red marble as we have been to Caine Minervois to see the quarry. We also saw the Grand Trianon palace. This is a palace that Louis XIV apparently built to house his mistress and is just a short walk from the main palace. We were told it’s called the pink palace because of the amount of red marble used to build it and there certainly is a lot of it. Thanks for another great blog. I wonder if they’ll actually install that marble. Would love to see that.